"What is this all about?!" 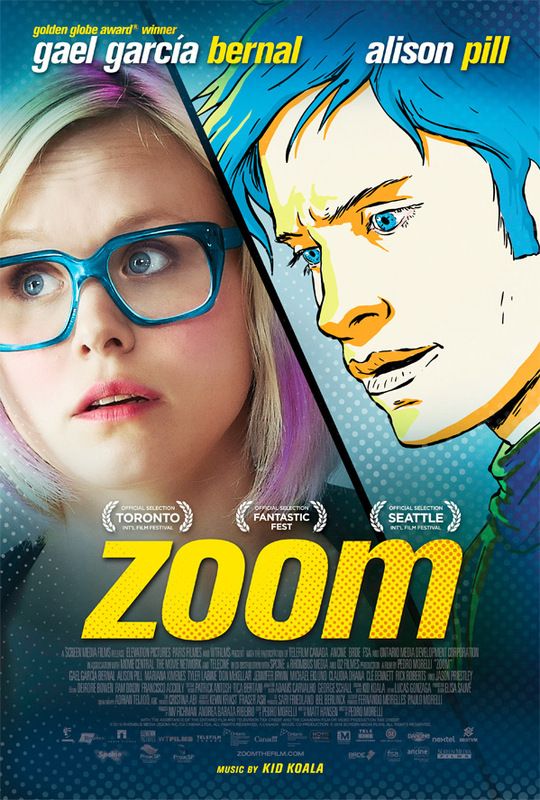 Screen Media Films has debuted a trailer for the indie comedy Zoom, about a comic book artist played by the talented Alison Pill (seen in Milk, Scott Pilgrim vs the World, Midnight in Paris, Goon, Snowpiercer, Hail Caesar!, and "The Newsroom"). This is a funky mashup because it combines the rather crazy live-action story with an animated (or perhaps rotoscoped?) comic book story, which is all of her frustrations come to life after they've been illustrated on paper. Gael García Bernal plays the primary, suave comic book character, and the rest of the cast includes Tyler Labine, Jason Priestley, Mariana Ximenes, Don McKellar and Michael Eklund. This actually looks fun in a quirky way, and I like the way they mix the animated comics with the real world story. Might be worth watching when it's out. For more, read this review stating Zoom is "three Canadian movies for the price of one" but it's entertaining. A multi-dimensional interface between a comic book artist, a novelist, and a film director. Each lives in a separate reality but authors a story about one of the others. An aspiring comic book artist (Alison Pill) works through her daily issues with a cartoon world of her creation starring Latin dreamboat Edward (Bernal), upon whom she unleashes her frustration in absurd and hilarious ways. Zoom is directed by Brazilian filmmaker Pedro Morelli (of Entre Nós previously), from a screenplay by Matt Hansen. This first premiered at last year's Toronto Film Festival, and also played at the Seattle Film Festival this summer. Screen Media Films will release Zoom in select theaters starting on September 2nd coming up. Thoughts? For sure. Reaper was awesome, and I've loved that guy ever since. That looks really cool. Love the animation. My god, Alison is just too cute in those glasses! Became a fan watching Newsroom. Looks good. Reminds me of the video for "Take On Me" by A-ha. https://www.youtube.com/watch?v=djV11Xbc914 With less facial oil of course. Looks super good. All the rotoscoped animation is bingo! Defo up for checking it. Looks very cool, hopefully I'll remember to try and find it. Love the premise, dig the style, I'm in.